Discussion in 'Civ5 - New Civilizations' started by Danmacsch, Jul 31, 2014. THIS PAGE IS CURRENTLY UNDER RE-CONSTRUCTION! 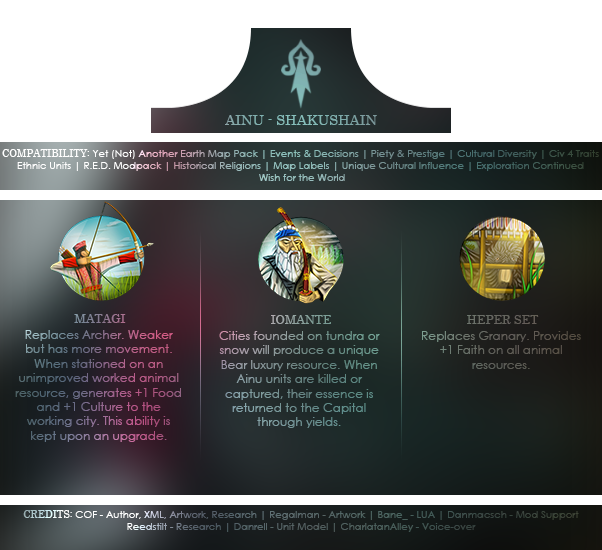 I am currently going through the process of updating all my currently released civilizations. Once updated, there will reappear here on this page, but all are still available on Steam. This is a list of civilizations which I have greatly contributed to in one way or other, but released by other modders/mod teams. The civilizations are to be considered the work of the respective modders/mod teams (or the people they have credited). The reason for including them here, is that I have at least to some degree taken over the maintenance of the mods, fixed reported bugs and updated code and compatibility to the standards of my own civilizations. Infographic links to the newest version, which currently isn't on Steam. If you want to write the Dawn of Man yourself, I'd be more than happy to look it over for you and fix any mistakes you may have made with the English, since you seem to have a relatively good grasp of it already. In terms of the abilities themselves, I think the UU and UA sound great as they are now, I'm just a bit worried about the UB. It seems very powerful with the 3 Great General slots, which I assume is why you've restricted it to only 3 cities. However, the Arsenal has later buildings which require it, which means that by limiting the Arsenal to just three cities you're also limiting the later buildings too, which could be a bit annoying for the player. I'd suggest dropping it to maybe one slot and then getting rid of the limit on the number of cities, which gets rid of the issue while still keeping it balanced. The map is made by the awesome regalman - and I agree it's really great! Regarding the DoM, thanks a lot, I'll pm it to you tonight. You might be right about the UB, I'm just afraid the UA won't be exploitable enough unless you can generate A LOT of Great Generals. But on the other hand, if you just provoke the other players in a game enough, they declare war on you and you'll get the generals anyway. Another thing I've been messing around with is the amount of Golden Age points you'll get per turn during wartime with a GG in a city. Right now it's just a static number but that just doesn't seem, well, very interesting. But i don't want to overcomplicate things either. Edit: by the way, is it possible to change the name of a thread? UA: From the Sea and the Sky. Coast, Deer, and Cattle tiles yield +1 faith after adopting a pantheon. Copper resources are doubled for trade, and trading copper to another civilization generates a small number of Golden Age points. UI: Nuraghe. Available at Masonry. May only be built on hills. May not be built next to another Nuraghe. Provides +15% defensive combat strength to adjacent* friendly units. Yields +2 culture when built. An Archaeologist may construct an Archaeological Dig on the improvement, adding +2 culture to its yield and a small number of Golden Age points but removing the defensive bonus. UU: Bull Ship. ** Replaces Trireme. +1 movement for a total of 5. +10% defensive combat strength when adjacent to a Nuargic city. A Bull Ship appears at no maintenance cost whenever a Great Prophet is born. *On the tile or 1 tile away. **Name to be changed, unless you want a bit of a laugh. Great job! Congrats on your first release! I'll have to give it a shot for when I play a new round of TSL . Viregel , The Rt. Hon. Fantastic! The civ looks great - out of interest, are you going to post it to the Steam Workshop? I couldn't find it there anyway, and it might be worthwhile. Anyway, keep up the good work; I'm expecting to see more from you soon. Edit: You might want to report this thread to get it moved to the New Civilisations section. Hi Maklohi Vai, glad you like it. Love to get some feedback on balance and such. Regarding your suggestions to the Nuragic civ; I like the copper-trade aspect very much, though maybe expanded to include iron. The other part is a bit boring IMHO (no offense ). I like the whole "bonus-of-some-kind-after-pantheon-is-adopted" thing, but the bonus - be it direct yields or something else - should be a little more interesting I think. Your UI suggestion is great. I think that captures what I had in mind for the civ very well. The Bull Ship (fantastic name ) I don't know about - going to have to think a bit more about it before commenting further. Hi TPangolin. Thank you very much. If you play a YnAEMP TSL game, be warned that most world maps doesn't even have Corsica on them (Sardinia and Corsica is merged on some of them), and on the giant world map as far as I remember Corsica is just a one tile island. Ont he Huge Europe map Corsica is also pretty small I think, but better. If you're interested I have a custom Giant Europe map (166x118) which is playable with YnAEMP. I can send you a download link if you want it. I am going to upload it to the Steam Workshop eventually - I just wanted the Civfanatics community's judgement first . Also I want to finish a few things on my To-Do list (see OP) before uploading it to steam. Congratulations for your first civ. Once I get my new PC I will make sure to give it a try. Ooh! An aspiring new modder! And fellow Scandinavian! Great mod, by the way. I just started a new game, but hopefully I'll see these guys in a game soon. Yep - and thanks . Ooh! Any plans for the Faroese or Åland? -diplomacy first greeting text isn't working. Apart from those very minor things it's looking really nice! They're doing quite well in the game I'm playing actually, haha. I'm already working on three new civs, but maybe at some point in the future. Hi Hiram, yep you're right about the colours. I guess I made the moor's head symbol on the icon a bit too dark - will update it in the next release. Further; just noticed that the trait explanation is actually wrong. I had a lot of difficulty with not getting it too long (so that it fitted on the leader selection screen). I had to rephrase it a bit and remove the Great General and War icons from the text. This will also be updated in the next update. Free Great General when another civilization declares war on you. During war, the Great General generates points toward Golden Ages, when placed in a city. Tourism bonus from Citadels after 'Printing Press'. This is a pretty solid debut -- I love the UA and theme. Ooh, this looks really nice. Plans to put in Events and Decisions? Those are what make a lot of new civs really intriguing for me. The UA name is a touch awkward though, but then I can't think of a really good one. Dio vi Salvi Regina might be nice? Maybe? Something in Corsican at least. But yes, the ancient people of Sardinia would make an absolutely fascinating civ, playing something like a European Sumer or Babylon or something. Thanks. Glad you like it. I love to get some comments on balance (the amount of Golden Age points you receive per Great General in a city and whether the tourism bonus per citadel, which is +1, should be changed to +2). Support for E&D is planned. One of the decisions, I think, should be something like outlawing the vendetta, since Paoli actually semi- successfully managed to bring down the number of vendetta killings per year (or some my sources tell me - it's hard finding actual proof of this). If choosing to outlaw vendetta your influence with cultural city-states would increase, but there's a risk your capital will enter Resistance for a number of turns. If choosing not to outlaw vendetta you would receive a permanent happiness boost, but a small random number citizens in some of your cities would die. Or at least that's my current thought. Feel free to share ideas. Also a possible event could be related to the British "Corsican Crisis". Regarding the UA name, I actually considered "Diu vi salvi Regina", but ultimately "Always Conquered, Never Subdued", which is a Corsican motto, catches more of the history of Corsica IMO; always being conquered by shifting major powers in Europe, but never really subdued. Don't know what it would be in Corsican though. I also considered "Mountain in the Sea", but since that is more a general description of the island, I think I'll save that for either the Nuragic civ (I know that's Sardinia, but it's only if I can't come up with something better) or for a possible future Torrean civ. Glad you like the idea of a Nuragic civ. I'm still in the process of designing the uniques, but please let me know if you have any ideas.